The Oklahoma City Thunder continue down the winning path defeating the New Orleans Pelicans in OKC at 122-116, but the win wasn’t the only exciting thing to come from the Thunder organization on Thursday night. Thunder forward Paul George was announced to the All-Star starting lineup for the Western Conference just a few hours before the game along with James Harden, Kevin Durant, LeBron James, and Steph Curry. George, who has had a phenomenal past few months playing some of the best basketball of his career, said it was an honor not only for himself and his team, but for the state of Oklahoma. PG picked up his 15th double-double of the season ending with 23 points and 11 rebounds, while another Thunder All-Star, Russell Westbrook, picked up his 15th triple-double of the season at 23 points, 17 rebounds, and 16 assists. This is the Thunder’s fourth straight win and the second straight for this three-game home stretch. Up next for OKC is against the Milwaukee Bucks on Sunday at 5 p.m. where MVP candidate Giannis Antetokounmpo may put this Thunder team to the test. 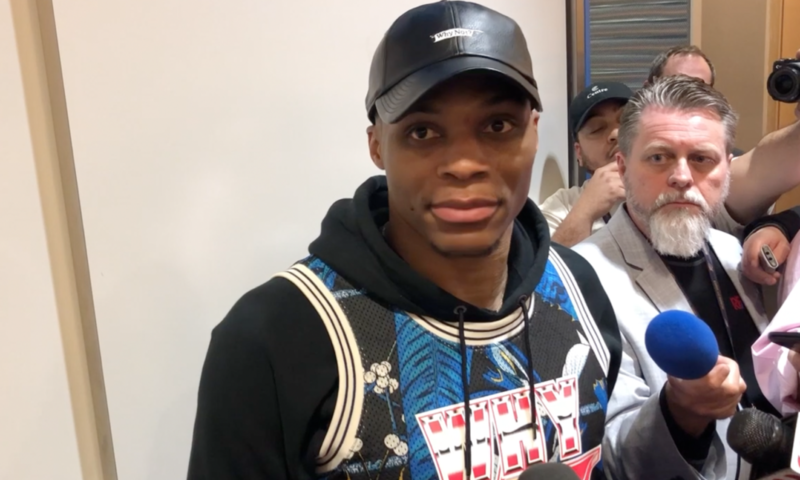 Watch below for a full postgame wrap-up from Thursday night’s Thunder win featuring TVs Jerry and full postgame pressers from Russell Westbrook, Paul George, and Abdel Nader.